One year after making the classic "haunted house" film THE UNINVITED (1944), director Lewis Allen and leading lady Gail Russell reunited for another spooky film, THE UNSEEN. 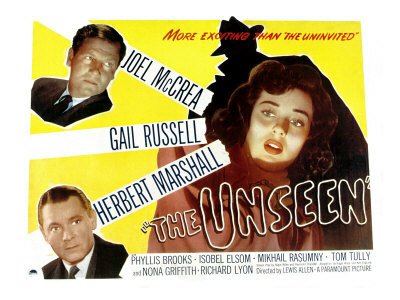 In THE UNSEEN young Elizabeth Howard (Russell) arrives at the home of widower David Fielding (Joel McCrea) to serve as governess to his two fairly disturbed children, Barney (Richard Lyon) and Ellen (Nona Griffith). The children's mother died in an accident three years previously, and their father is often absent. Barney is hostile to kind "Miss Liz" and engages in odd behavior such as hanging a toy elephant in his window each evening. THE UNSEEN is a very good, atmospheric film for most of its 80-minute running time, marred only by a truncated, somewhat nonsensical ending which doesn't satisfactorily explain all that has occurred previously. The suspense builds and builds, and then...that's it? Perhaps it's not surprising that the plot is a bit murky, given that it was co-written by Raymond Chandler, author of the book which inspired one of the most confusing movies of all time, THE BIG SLEEP (1946). 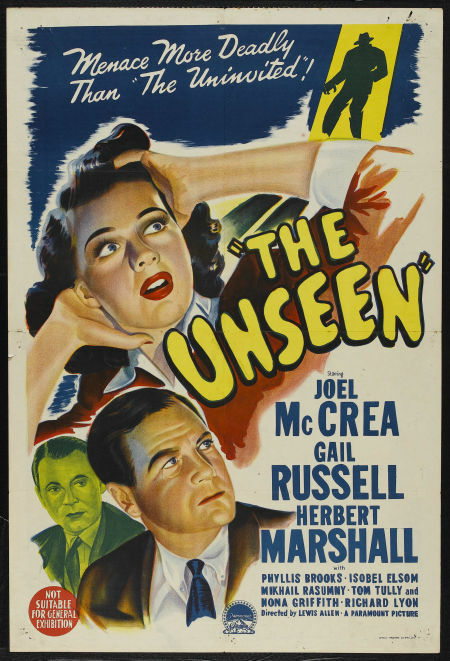 The script was based on the novel HER HEART IN HER THROAT by Ethel Lina White; the book was later republished under the title THE UNSEEN. Russell is quite good in this, in an appealing performance. Her Liz stands up to her brusque boss ("I said good night!") and doesn't back down when confronted with scary situations. She conveys a sharp-eyed intelligence and dedication to the children, and all in all plays a much stronger character than she portrayed in THE UNINVITED. McCrea's character is a bit underdeveloped. David veers back and forth between being rude and falling almost instantly for lovely Elizabeth...we understand he's had a rough time of it since his wife died, but there just aren't quite enough blanks filled in to help the audience understand him. I also had a little trouble figuring out what he knew and when in regards to the story's final developments. Richard Lyon and Nona Griffith deliver excellent performances as the troubled children. Griffith, who has a sweetness somewhat reminiscent of Margaret O'Brien, does not have any further credits listed with IMDb. Lyon was the adopted son of actors Ben Lyon and Bebe Daniels. His first film credit was THE HOWARDS OF VIRGINIA in 1940; one of his most notable roles was playing Louis, the son of Anna (Irene Dunne), in ANNA AND THE KING OF SIAM. He is quite effective as an almost creepy little boy who seems to be in serious need of some kind of therapy. Tom Tully relieves some of the film's tension when his Detective Sullivan arrives on the scene. The cast also includes Isobel Elsom, Phyllis Brooks, Norman Lloyd, Elisabeth Risdon, and Mary Field. The film's opening narrator is Ray Collins. This Paramount film has not been released on VHS or DVD. Let's hope that it makes its way to Turner Classic Movies; perhaps one day it can be run in a double bill with THE UNINVITED.